All Urban is celebrating a new partnership by launching FinBin’s premium outdoor bins to British businesses. The suppliers specialises in distributing street furniture and lighting to the UK and will add FinBin to their designer brand portfolio. 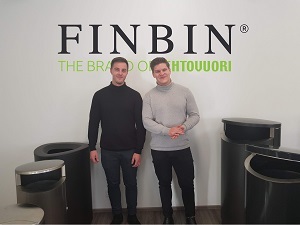 Based in Finland, FinBin manufacture and supply premium-quality designer litter bins. Highly regarded in their native country, FinBin are renowned for producing stylish and durable products. Last year, they achieved 20% growth within export, and with plans to broaden their distribution plans across Europe, All Urban’s commitment to original design and high-quality suppliers made them the perfect match for the UK. The partnership begins at a crucial time for the UK’s waste management industry. In December 2018, the UK government launched a new landmark blueprint, ‘Resources and Waste Strategy’ to England’s businesses and manufacturers. Research suggests that recycling rates in businesses are often lower than households. There are plans to review collections models which will improve recycling and reduce costs. The strategy sets out how England will preserve material resources by minimising waste, promoting resource efficiency and move towards a circular economy. FinBin manufacture stylish modular bins, where designs include multiple apertures to allow multi-use waste disposal easing recycling for both public and businesses. Their superior bins are made with galvannealed steel which drastically improves durability in comparison to galvanised steel adding extra resistance to weathering and outdoor use making them ideal long-term waste management solutions. FinBin have also manufactured a next-generation smart bin, the CitySolar. It is a 240-litre wheeled waste container which contains a sensor inside the bin which registers when the bin is getting full, triggering the compactor. This enables the bin to hold 1920 litres of material, eight times the volume of un-compacted waste. Their bins are already popular around the world, having been installed in some of the most prestigious cities and transport hubs including Dubai train station, Manchester metro link, Helsinki and Bilbao cities, and Luton and Washington DC airports.